The only sure things in this life are death, taxes and the need to buy new printer ink cartridges every few months. Buying a set of new ink cartridges nowadays usually costs more than the price of the printer, and their low life span is the bane of every home office user’s existence. Epson has come to the rescue with its revolutionary range of EcoTank printers, of which the Epson ET 4550 is the flagship model. As you’ll soon see, the days of ink cartridges are numbered. The principle behind the EcoTank range is simple. Instead of using cartridges that only hold a tiny amount of liquid, Epson’s latest printers instead have large ink tanks on one side of the printer. They hold a much larger amount of ink, which is delivered to the user in vacuum-sealed bags, and which must be squirted into each tank. We managed to complete this task with a minimum of fuss, with just a single drop of the black ink landing on our white desk. The Epson ET 4550 comes with large ink bottles for the three primary colors (Yellow, Magenta and Cyan), as well as an even bigger black. It also includes a second set of smaller bottles as a free bonus. What makes this system remarkable is the number of pages that each bottle can print. The large black bottle can print, wait for it, 11,000 pages before needing a refill. Yes, we said 11,000! That’s the equivalent of around 50 ink cartridges, which would set owners back around $2000. By now you’re probably expecting the bad news, that each replacement ink bottle costs upwards of several hundred dollars, but you’d be wrong. The large black ink bottle used by the Epson ET 4550, making each page cost a mere 0.22c each. We’re not usually ones to get excited by printers, but this is simply an incredible leap forward for printer technology. As for color pages, the numbers aren’t quite so high, but they’re still amazing. With the ink included in the box, the ET-4550 can print a whopping 8,500 pages, and the replacement cost for ink pots is the same as black. It’s simply incredible compared to the way we’ve printed until now. Obviously there’s a trade-off, and it’s the up-front price of the printer. However, even at this price the ET-4550 is outstanding value for money over the long term. If you’d like to spend a little less, the entry-level EcoTank, and will print 4000 black pages, 6500 color. After printing several color game manuals and photos, we were very impressed by the print quality, matching other high-end ink-jet printers. It’s also great at photo printing, provided you use the right paper. Epson’s PrecisionCore technology ensures very accurate color tones at this price point, and we think most people would be more than happy with the overall print quality delivered by the Epson ET 4550. 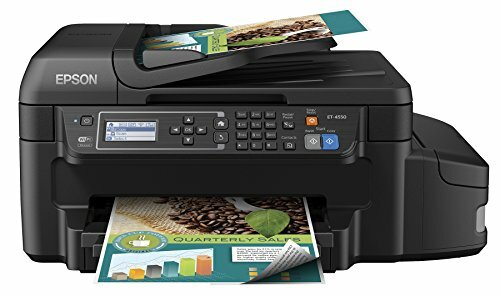 Max print resolution of 4800 x 1200 dpi • ISO Print speed • Black 13 ppm, Color 7.3ppm • Automatic 2-side printing • Color flatbed scanner with 2400 dpi optical resolution. Includes enough ink to print up to 11,000 pages black/8,500 color (2) - equivalent to about 50 ink cartridge sets (3). This is an opportunity to let you know my 4550 ET blk. ink won’t let me fill.